This Microgaming slot can make you very luck indeed, with huge prizes and gambles on offer, test your mettle and see what the odds are when you trigger the generous free spins bonus game. You have the choice of keeping your winnings, re-playing your free spins or handing all the cash in for a mystery prize. 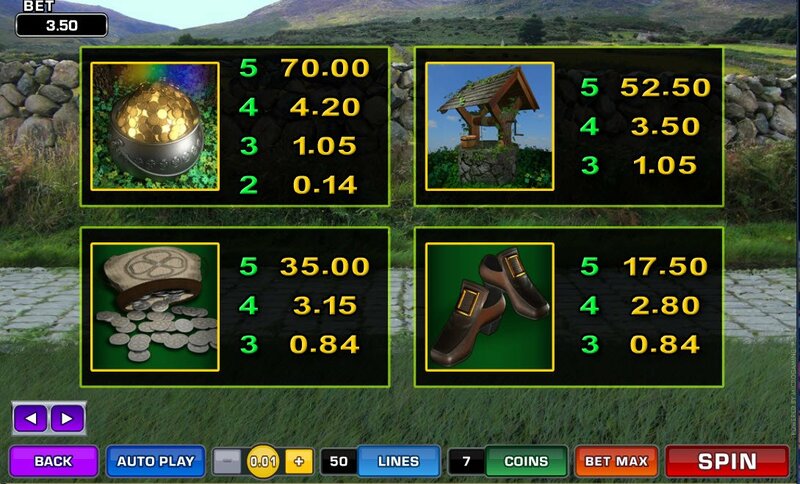 This is one exciting Lucky Leprechaun Loot slot game. Microgaming's Lucky Leprechaun Loot slot most certainly contains the luck of the Irish, as on my first spin I was rewarded with 6 free games, all at a 3x multiplier, that were then retriggered to a further 6. All the while spinning an Irish jig to create the atmosphere. 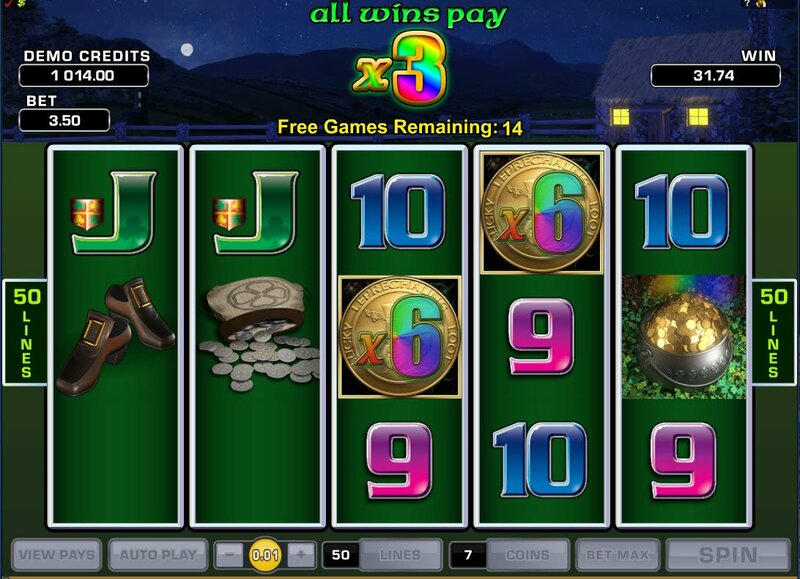 Lucky Leprechaun Loot is a 5-reel, 50 payline slot machine from the ever brilliant Microgaming. Graphics are clear, defined and brightly coloured, in addition to a nice Irish flute and conjure up dancing leprechauns with rainbows and pots of gold laying just a stone's throw away. 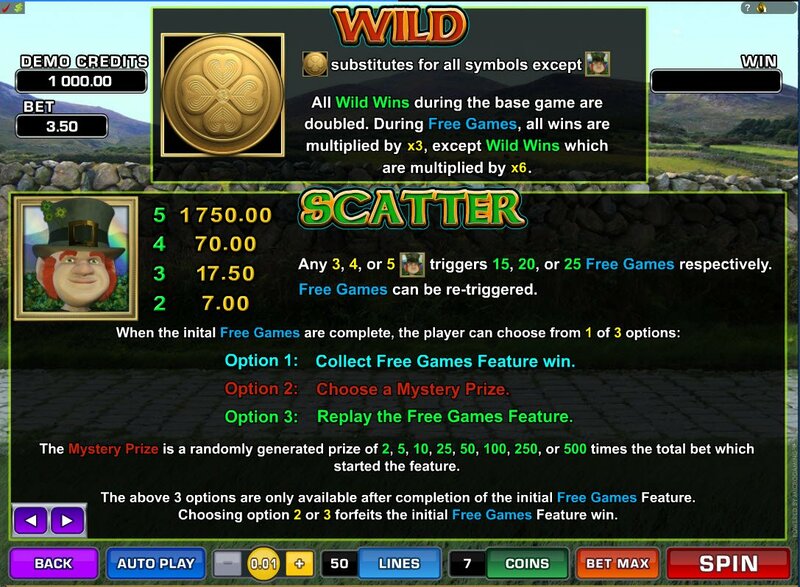 One notable feature is that any payline that is completed with the inclusion of a Gold Clover doubles your earnings immediately. There are lucky four-leaf clovers, wishing wells and pots of gold that the little fellas have collected from the ends of all the rainbows ever made, decorating your screen. Emerald hills roll in the background as the 50-paylines spin round to give you prizes. Microgaming's Lucky Leprechaun Loot slot most certainly contains the luck of the Irish, as on my first spin I was rewarded with 6 free games, all at a 3x multiplier, that were then retriggered to a further 6. All the while spinning an Irish jig to create the atmosphere. Up to 25 free Lucky Leprechaun bonus spins are available to be won. I was offered 3 choices: to collect my £175, to gamble my win for a mystery prize or to replay my free games. Whatever you do, don't choose option number 2. I was left with £7, multiplied dutifully by 3 to give me a prize of £21. So, be wary as the luck amongst these notoriously mischievous little scamps, the leprechauns does not last forever. The added sting of a potential 500x my initial prize that could have been won leaves me needing to go down my nearest Irish pub for a strong, stiff pint of Guinness. The Lucky Leprechaun Loot Free Spins Bonus Game can certainly be extremely rewarding, if played right.